The greatest novelty is the cameras – but unlike in other manufacturers where the two sensors work together, the rear cameras on the Aquos R2 are independent – one is for movies and the other is for photos. This allows the user to shoot movies and still images at the same time at the desired resolution without the former interfering with the latter. You can do this either manually or automagically – with the help of Artificial Intelligence, the photo sensor detects the subject, composition, exact moment of smiling, etc., while the other camera is recording video, and captures the best images possible. The still image camera is 22.6 megapixels with a focal length equivalent of 22 mm film. This camera has optical image stabilisation (OIS) and uses PDAF (phase-detection auto focus). The aperture size on the photo camera remains f/1.9 for proven impressive night-time photography. The still image camera is re-branded ProPix, which was the name Sharp's professional series CCD matrix feature phones had in the years between 2008 and 2011. 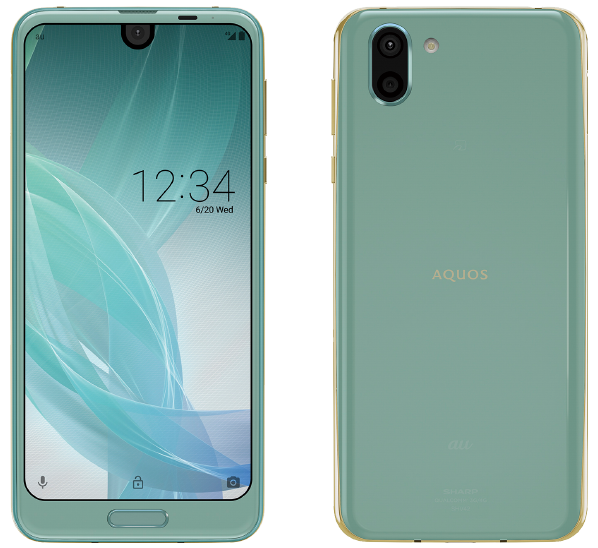 We can assume that the viewing angle is the 90° found on last year's Aquos R.
Meanwhile, the video camera has a 16.3-megapixel sensor with an ultra-wide 135° viewing angle ("Dramatic Wide Camera") and a focal length of 19 mm film (in 35 mm film equivalent). The aperture size is f/2.4 and and the camera employs electronic image stabilisation (EIS) for a maximum resolution of 4K2K. It should be noted that, when EIS is activated, the 135° viewing angle is decreased, but Sharp have not specified by how much. The video camera can also do high-speed shooting: 240 fps at 720p, 120 fps at 1080p (up to 30 seconds), where the frames actually captured by the video sensor are then interpolated to produce impressive slow-motion videos. The front-facing camera is 16.3 megapixels and looks like it's the same as found on the Aquos R: 90° wide-angle shooting, aperture f/2.0, electronic image stabilisation for video – which the selfie sensor can capture in 4K resolution. The selfie-camera can now blur the background like in professional portrait shooting. The display is an upgrade from the Aquos R. With 6.0 inches in size, this is the largest display ever installed on a Sharp smartphone. The same goes about its WQHD+ resolution of 3040 x 1440 pixels (19:9). And yes, it's an IGZO. No, it's not an OLED display – much to my relief, I must say, as I am a strong opponent of everything LED for the irreparable damage its constant flickering (pulse-width modulation, or PWM) does on the eyes and mental capacity. It is yet unclear if Sharp have managed to overcome the difficulties they were facing last year with building a free-form IGZO with the touch-sensors integrated (in-cell technology). Because it's an IGZO display, like in earlier flagships (and not only), you can operate the touch screen with wet hands and with gloves. This is a free-form display having a total of five cuts – one notch for the selfie camera and four at the corners – the Aquos R, the Aquos R compact, and the Chinese Aquos S1 and S2, only have their top corners round (well... almost, Aquos S1, ahem). Personally, rounded corners is something I dislike for being artificial and useless. The Aquos R2 display will refresh 100 times per second for smooth unblurred video playback, gaming, and even scrolling up or down on web page – something only a Sharp-made display can do. Although the screen refresh rate has now been reduced from the 120 Hz on previous flagship models, Sharp claim they have improved response speed by about 25% in comparison with the Aquos R, as well as achieved better energy saving. In addition to the Rich Color Technology Mobile adopted from high-end Aquos TVs (ensuring realistic reproduction of a wider range of luminance and colour gamut), Sharp have further enhanced the display by adopting the cutting edge – and world's first – Dolby Vision. But why stop here? The Aquos R2 also employs the Dolby Atmos stereophonic technology and its sound engine utilises the next-generation audio codec "DolbyⓇ AC-4". This smartphone can play HDR 10 and VP9 (Google's own video compression codec) videos. Like all recent Sharp phones, the Aquos R2 display has an intelligent blue-light reduction function to combat eye-fatigue. And because blue light is also connected to difficulty falling asleep, the amount of blue-light is automatically decreased a couple of hours before your usual bed-time. The Aquos R2 learns this via the phone's AI called Emopa. Of course you can also choose to reduce blue light manually whenever you want. Thanks to the very narrow bezels, the Aquos R2 physical dimensions are almost the same as those of the Aquos R: 156 × 74 × 9 mm versus 153 × 74 × 8.7 mm. However, a substantial increase in the screen size has been achieved from 5.3 to 6.0 inches. Considering the various improvements, the weight of 181 grams is not a lot more than the 169 grams on the Aquos R.
Another major selling point of the Aquos R2 is improved heat-dissipation (twice in comparison to the Aquos R) that does not allow the phone body to heat up even during intensive use such as gaming. The Aquos R2 is powered by the latest high-end Qualcomm processor, the Snapdragon 845 (four 2.6 GHz and four 1.7 GHz cores), has 4 GB of RAM (LPDDR 4X), 64 GB of ROM of the universal flash storage (UFS) type, expandable using microSDXC cards of up to 400 GB! Sounds as powerful as you can get with big-brand flagships. The Aquos R2 has a curved metal frame encompassing the body and a 3D-glass back. The Aquos R2 has Bluetooth 5.0 and Wi-Fi a/b/g/n/ac at both 2.4 GHz and 5.x GHz). NFC/Felica mobile payments are supported as well as both OneSeg and FullSeg digital TV. The built-in battery has a capacity of 3130 mAh, which, considering the IGZO energy-saving tech, should easily last you two full days in heavy use, and four or even five days in light use. Being a Japanese model, it is waterproof (IPX5/X8) and dustproof (IP6X). The pre-installed OS version is Android 8.0. The battery capacity is 3130 mAh. The Aquos R2 is, like the previous model, optionally supplied with the Roboqul rotating charging stand, which lets the phone's AI assistant Emopa, now in version 8.0, detect its owner's face and rotate accordingly and inform him or her of the weather, missed calls, etc.